Nosh Hound Eatery is the brainchild of owners Sam Ralbovsky and Maycie Maringer inspired by their passion for food and love for their basset hound, Clyde. 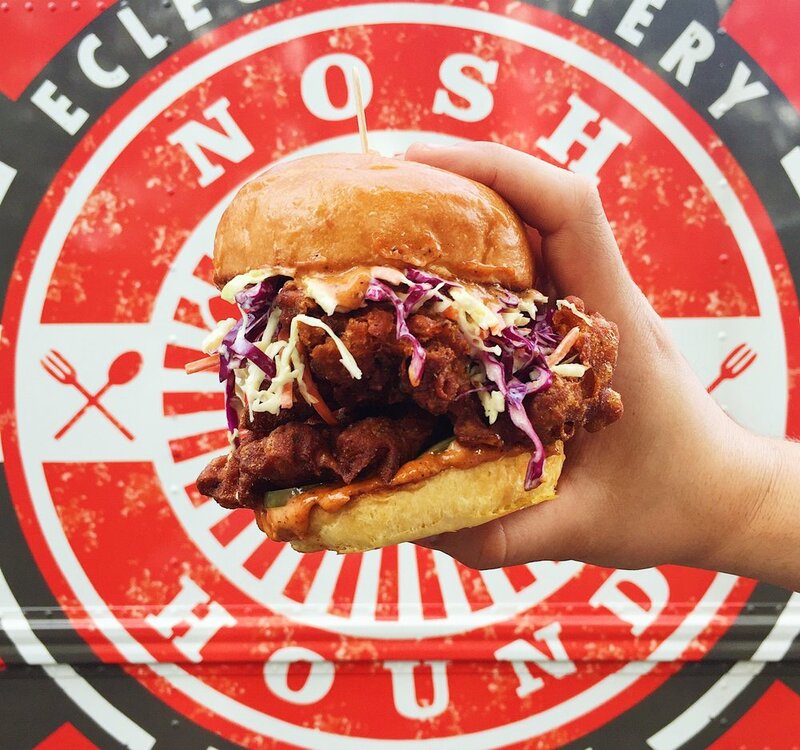 Located in Stamford, Connecticut, Nosh Hound is a purveyor of global cuisine experienced through the medium of sandwiches, bowls, and bites. After graduating from the Culinary program at Johnson & Wales University and taking a three month cross country food inspired road trip, Sam and Maycie moved back to Sam’s hometown of Stamford, CT. On that trip, both young cooks fell in love with the diverse cooking styles found throughout the country and a basset hound puppy they adopted along the way. They encountered everything from the expertly curated food at some of the countries most refined restaurants to the down-home cooking they found in the most unexpected places along the way. Sam and Maycie knew their purpose was to bring that knowledge back to Connecticut. Nosh Hound’s mission is to take the familiar foods of the average American and transform them into something truly unique. Whether it be the Korean Cheesesteak, a Seoul spin on the Philly classic, or the Eastern European inspired Hound Dog, the chef's at Nosh Hound are always thinking of new ways to showcase their talents and provide noshers with new culinary experiences. With this mission in mind, the Nosh Hound staff is always striving to provide our customers with fresh and locally sourced ingredients.